"Gaza is Israel's Warsaw -- a vast concentration camp that confined and blockaded Palestinians. We are witness to a slow-motion process of genocide." Professor William I. Robinson, University of California at Santa Barbara. The "slow-motion process of genocide" in Gaza that the Jewish-American professor refers to has just accelerated in the last few weeks with relentless Israeli bombing of the civilian population with most modern and extremely lethal weaponry supplied by the United States. Over 80% of the 1000+ casualties in Gaza are civilians so far while the overwhelming majority of casualties (about 40) on the Israeli side are of Israeli soldiers. It's not just US arms that are aiding and abetting this accelerating genocide targeting the Gaza children of Palestinians; the US mainstream media and the US politicians are active collaborators in this crime against humanity. Fortunately, the western media, particularly the US media, now has serious competition from the rapidly growing social media. And Israel and its supporters are badly losing this war for the hearts and minds of the people of the world. Even in the United States, in spite of the pro-Israel US mainstream media propaganda, a recent Gallup poll shows that the tech-savvy younger generation of Americans age 18-29 believes by 2:1 that "Israel's actions are unjustified". 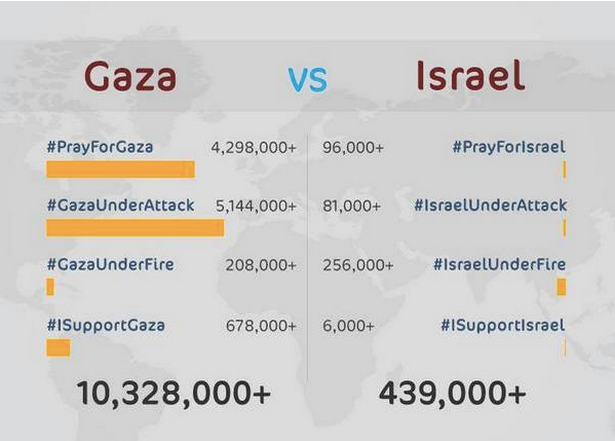 The most popular hashtags in support of Gazans are #GazaUnderAttack and #PrayForGaza. Please do not underestimate the power of the social media. I urge you to join the social media battle to support Palestinians in their hour of need by tweeting with pro-Gaza hashtags #GazaUnderAttack and #PrayForGaza. Is Obama True Friend of Israel? Yes, but it also shows, the higher the education level, the higher the support for Israel, with the same 2:1 margin in favor for those with postgraduate edumacation. Why do you think that would be Sir? Obvious, the 18-29 demographic is gullible, and unlikely to stay with these views for long. QUOTE: "Americans are divided in their views of whether Israel's actions against the Palestinian group Hamas is "mostly justified" or "mostly unjustified," but they widely view Hamas' actions as mostly unjustified. Those results are similar to what Gallup measured 12 years ago during another period of heightened Israeli-Palestinian violence, and they are consistent with Americans' generally more positive views of the Israelis than of the Palestinians." VC: "Yes, but it also shows, the higher the education level, the higher the support for Israel, with the same 2:1 margin in favor for those with postgraduate edumacation. Why do you think that would be Sir? Obvious, the 18-29 demographic is gullible, and unlikely to stay with these views for long." The views of Americans reflect the sources of news and information used by various age groups. The youngest of those polled do not care much for the legacy media and ignore its pro-Israel bias. The overall figure you quote reflects the views of America's aging population. Bottom Line: It shows the views of the youngest Americans are in sync with the rest of the world. Older Americans are out of touch with reality in the Middle East. What difference does it make to them? Ground reality is that innocent Palestinians are being killed in cold blood evrn now, Israel is illegally expanding its frontiers even now . . .
"Sticks n stoned will hurt my bones, but not name-calling" is the creed by which these countries live. Rest is eye wash.
Farid: "What difference does it make to them? Ground reality is that innocent Palestinians are being killed in cold blood evrn now, Israel is illegally expanding its frontiers even now . . .
"Sticks n stoned will hurt my bones, but not name-calling" is the creed by which these countries live. Rest is eye wash."
So your plan is to surrender rather than do what you can about it? My suggestion is for each of us to do what we can to help Palestinians' genuine cause for dignity, freedom and equality. Boston Globe: "Israeli-imposed buffer zones.. now absorb nearly 14 percent of Gaza's total land and at least 48 percent of total arable land. Similarly, the sea buffer zone covers 85 percent of the maritime area promised to Palestinians in the Oslo Accords, reducing 20 nautical miles to three." Human Rights Watch: "Israel also continues to control the population registry for residents of the Gaza Strip, years after it withdrew its ground forces and settlements there." B'Tselem, 2013: "Israel continues to maintain exclusive control of Gaza's airspace and the territorial waters, just as it has since it occupied the Gaza Strip in 1967." Al Jazeera: "Meshaal said Hamas wants the 'aggression to stop tomorrow, today, or even this minute. But [Israel must] lift the blockade with guarantees and not as a promise for future negotiations'. He added 'we will not shut the door in the face of any humanitarian ceasefire backed by a real aid programme'." Jerusalem Post: "One day after an Egyptian-brokered cease-fire accepted by Israel, but rejected by Hamas, fell through, the terrorist organization proposed a 10-year end to hostilities in return for its conditions being met by Israel, Channel 2 reported Wednesday.. Hamas's conditions were the release of re-arrested Palestinian prisoners who were let go in the Schalit deal, the opening of Gaza-Israel border crossings in order to allow citizens and goods to pass through, and international supervision of the Gazan seaport in place of the current Israeli blockade." BBC: "Israel's security cabinet has rejected a week-long Gaza ceasefire proposal put forward by US Secretary of State John Kerry 'as it stands'." The Guardian: "It was there that the second [Israeli] shell hit the beach, those firing apparently adjusting their fire to target the fleeing survivors. As it exploded, journalists standing by the terrace wall shouted: 'They are only children.'" UN high commissioner for human rights Navi Pillay: "A number of incidents, along with the high number of civilian deaths, belies the [Israeli] claim that all necessary precautions are being taken to protect civilian lives." United Nations Fact Finding Mission on the Gaza Conflict, 2009: "The tactics used by the Israeli armed forces in the Gaza offensive are consistent with previous practices, most recently during the Lebanon war in 2006. A concept known as the Dahiya doctrine emerged then, involving the application of disproportionate force and the causing of great damage and destruction to civilian property and infrastructure, and suffering to civilian populations. The Mission concludes from a review of the facts on the ground that it.. appears to have been precisely what was put into practice." Human Rights Watch: "Israeli forces may also have knowingly or recklessly attacked people who were clearly civilians, such as young boys, and civilian structures, including a hospital - laws-of-war violations that are indicative of war crimes." Amnesty International: "Deliberately attacking a civilian home is a war crime, and the overwhelming scale of destruction of civilian homes, in some cases with entire families inside them, points to a distressing pattern of repeated violations of the laws of war." Jeremy Bowen, BBC Middle East editor: "I saw no evidence during my week in Gaza of Israel's accusation that Hamas uses Palestinians as human shields." The Guardian: "In the past week, the Guardian has seen large numbers of people fleeing different neighbourhoods.. and no evidence that Hamas had compelled them to stay." The Independent: "Some Gazans have admitted that they were afraid of criticizing Hamas, but none have said they had been forced by the organisation to stay in places of danger and become unwilling human-shields." Reuters, 2013: "A United Nations human rights body accused Israeli forces on Thursday of mistreating Palestinian children, including by torturing those in custody and using others as human shields." Times of Israel: "Hamas operatives were behind a large volley of rockets which slammed into Israel Monday morning, the first time in years the Islamist group has directly challenged the Jewish state, according to Israeli defense officials.. The security sources, who spoke on condition of anonymity, assessed that Hamas had probably launched the barrage in revenge for an Israeli airstrike several hours earlier which killed one person and injured three more.. Hamas hasn't fired rockets into Israel since Operation Pillar of Defense ended in November 2012." The Nation: "During ten days of Operation Brother's Keeper in the West Bank [before the start of the Gaza conflict], Israel arrested approximately 800 Palestinians without charge or trial, killed nine civilians and raided nearly 1,300 residential, commercial and public buildings. Its military operation targeted Hamas members released during the Gilad Shalit prisoner exchange in 2011." Jewish Daily Forward: "Hamas hadn't fired a single rocket since [2012 Gaza conflict], and had largely suppressed fire by smaller jihadi groups. Rocket firings, averaging 240 per month in 2007, dropped to five per month in 2013." International Crisis Group: "Fewer rockets were fired from Gaza in 2013 than in any year since 2001, and nearly all those that were fired between the November 2012 ceasefire and the current crisis were launched by groups other than Hamas; the Israeli security establishment testified to the aggressive anti-rocket efforts made by the new police force Hamas established specifically for that purpose.. As Israel (and Egypt) rolled back the 2012 understandings - some of which were implemented spottily at best - so too did Hamas roll back its anti rocket efforts." Jewish Daily Forward: "The [Israeli] government had known almost from the beginning that the boys were dead. It maintained the fiction that it hoped to find them alive as a pretext to dismantle Hamas' West Bank operations.. Nor was that the only fib. It was clear from the beginning that the kidnappers weren't acting on orders from Hamas leadership in Gaza or Damascus. Hamas' Hebron branch -- more a crime family than a clandestine organization -- had a history of acting without the leaders' knowledge, sometimes against their interests." BBC correspondent Jon Donnison: "Israeli police MickeyRosenfeld tells me men who killed 3 Israeli teens def lone cell, hamas affiliated but not operating under leadership.. Seems to contradict the line from Netanyahu government." US State Department cable: "Israeli officials have confirmed to Embassy officials on multiple occasions that they intend to keep the Gazan economy functioning at the lowest level possible consistent with avoiding a humanitarian crisis.. Israeli officials have confirmed.. on multiple occasions that they intend to keep the Gazan economy on the brink of collapse without quite pushing it over the edge." The Guardian: "The Israeli military made precise calculations of Gaza's daily calorie needs to avoid malnutrition during a blockade imposed on the Palestinian territory between 2007 and mid-2010, according to files the defence ministry released on Wednesday under a court order.. The Israeli advocacy group Gisha.. waged a long court battle to release the document. Its members say Israel calculated the calorie needs for Gaza's population so as to restrict the quantity of food it allowed in." Times of Israel: "[Netanyahu] made explicitly clear that he could never, ever, countenance a fully sovereign Palestinian state in the West Bank.. Amid the current conflict, he elaborated, 'I think the Israeli people understand now what I always say: that there cannot be a situation, under any agreement, in which we relinquish security control of the territory west of the River Jordan.'" Nathan Thrall, senior Mid East analyst at the International Crisis Group, writing in the New York Times: "The current escalation in Gaza is a direct result of the choice by Israel and the West to obstruct the implementation of the April 2014 Palestinian reconciliation agreement." Henry Siegman, former national director, American Jewish Congress, writing for Politico: "Israel's assault on Gaza.. was not triggered by Hamas' rockets directed at Israel but by Israel's determination to bring down the Palestinian unity government that was formed in early June, even though that government was committed to honoring all of the conditions imposed by the international community for recognition of its legitimacy." Let me be frank. Dozens of British supporters of Israel do serve in the Israeli army. The same applies for Australia, New Zealand, Canada and the US. And they don’t necessarily gravitate to being war criminals. This may not be what an Arab would say – and it is certainly not what Israelis would suggest. But there is plenty of evidence – from 1982 in Lebanon, from 1996 in Qana, from 2008-9 in Gaza and again in Gaza these past two weeks – that individual Israeli soldiers and pilots have committed acts which, under international law, are war crimes. I’m struck by the words of the co-director of the Israeli veterans’ movement Breaking the Silence, Yehuda Shaul, who spoke at a meeting in Tel Aviv a couple of weeks ago about the brutalising effect of occupying other people’s lands. Mass arrests, the liquidation of even a suspicious “silhouette”, families paralysed with fear during searches. “You adapt to it all,” Shaul said. “The first time, you’re in a state of shock, the second time, a bit less, and at the end of the week, you do it quite naturally.” Interesting. It sounds as if Shaul is talking about being radicalised. Isn’t that what we say about certain other young British citizens with weapons who head off to the Middle East? But what are we to expect when Major-General Gadi Eizenkot – now a deputy chief of staff in the Israeli army – pointedly said in a newspaper interview six years ago that he would use disproportionate force on a village or city from which rockets were fired, famously adding that “from our standpoint these are not civilian villages; they are military bases”? Which explains a lot of what happened over the past two weeks in Gaza. And as Muhammad Ali Khalidi, Philosophy Professor at York University in Toronto, points out, intentionally striking civilians in order to accomplish political ends is “the dictionary definition of terrorism”. After all, isn’t that what Hamas also does? Actually, that 18-26 demographic has always been that way, whether be it the Vietnam war or Middle East. This is not as much a "new vision" change as you are making it out to be. VC: "Actually, that 18-26 demographic has always been that way, whether be it the Vietnam war or Middle East. This is not as much a "new vision" change as you are making it out to be." In addition to the fact that US no longer has military draft that was opposed by young Americans in 1960s, it is also a fact that Israel is very different from Vietnam. US anti-war liberals, human rights activists and US media have traditionally applied different rules to Israel than to the rest of the world. It's now beginning to change mainly due to the social media challenging the pro-Israel mainstream media. There is a reason for this enhancement of the PR skills of Israeli spokesmen. Going by what they say, the playbook they are using is a professional, well-researched and confidential study on how to influence the media and public opinion in America and Europe. Written by the expert Republican pollster and political strategist Dr Frank Luntz, the study was commissioned five years ago by a group called The Israel Project, with offices in the US and Israel, for use by those "who are on the front lines of fighting the media war for Israel". Every one of the 112 pages in the booklet is marked "not for distribution or publication" and it is easy to see why. The Luntz report, officially entitled "The Israel project's 2009 Global Language Dictionary, was leaked almost immediately to Newsweek Online, but its true importance has seldom been appreciated. It should be required reading for everybody, especially journalists, interested in any aspect of Israeli policy because of its "dos and don'ts" for Israeli spokesmen. These are highly illuminating about the gap between what Israeli officials and politicians really believe, and what they say, the latter shaped in minute detail by polling to determine what Americans want to hear. Certainly, no journalist interviewing an Israeli spokesman should do so without reading this preview of many of the themes and phrases employed by Mr Regev and his colleagues. The booklet is full of meaty advice about how they should shape their answers for different audiences. For example, the study says that "Americans agree that Israel 'has a right to defensible borders'. But it does you no good to define exactly what those borders should be. Avoid talking about borders in terms of pre- or post-1967, because it only serves to remind Americans of Israel's military history. Particularly on the left this does you harm. For instance, support for Israel's right to defensible borders drops from a heady 89 per cent to under 60 per cent when you talk about it in terms of 1967." BEIT HANOUN, Gaza — This narrow strip of land that used to be called “the Gaza Strip,” already one of the more densely populated places on Earth, is growing dramatically smaller. The Israeli military, relentlessly and methodically, is driving people out of the 3-kilometer (1.8 mile) buffer zone it says it needs to protect against Hamas rockets and tunnels. According to the United Nations Office for the Coordination of Humanitarian Affairs, the buffer zone eats up about 44 percent of Gaza’s territory. It’s not like Israel didn’t plan this. It told tens of thousands of Palestinians to flee so its air force, artillery and tanks could create this uninhabitable no-man’s land of half-standing, burned-out buildings, broken concrete and twisted metal. During a brief humanitarian ceasefire some Gazans were able to come back to get their first glimpse of the destruction this war has brought to their communities, and to sift through their demolished homes to gather clothes or other scattered bits of their past lives. But many were not even able to do that. When Rania Haels got within 60 feet of the debris that was once her family home in Al Shajaya on Saturday, a machine-gun on top of a nearby Israeli Merkava tank started firing. Probably these were warning shots pumped in her direction, but the 42-year-old mother of seven ran for her life. Now she stays with her family in an overcrowded parking garage in Gaza City and spends her days sitting in a public park full of refugees displaced by the Israeli push. Normally these would be festive times, the end of Ramadan is at hand and celebrations akin in spirit to Christmas festivities are beginning. But holidays have a way of intensifying tragedy. There is no place for Haels’ family to gather to give gifts and eat Palestinian sweets. There is, in fact, no place for them at all. “We lost our homes and so now we live in the streets,” said Haels, holding a toddler in her arms who clings to her pastel-patterned hejab. “This war has destroyed me.” She says at least she knew where her home was. Some of her neighbors could not find their homes as they walked down streets made unrecognizable by the wreckage and horrifying by the presence of death. Racism has become a legitimate, indeed an integral, component of Israeli public culture, making assertions like these seem “normal.” The public devaluation of Arab life enables a society that sees itself as “enlightened” and “democratic” to repeatedly send its army to slaughter the largely defenseless population of the Gaza Strip—1.8 million people, mostly descendants of refugees who arrived during the 1948 Arab-Israeli war, and have been, to a greater or lesser extent, imprisoned since 1994. Conciliatory gestures, on the other hand, are scorned. Just two days after Shaked’s Facebook post, Orthodox Jews kidnapped 16-year-old Muhammad Abu Khdeir from the Shu‘afat neighborhood of East Jerusalem and burned him alive in the Jerusalem Forest. Amir Peretz (Hatnua) was the only government minister to visit the grieving family. For this effort he received dozens of posts on his Facebook page threatening to kill him and his family. Meanwhile, vandals twice destroyed memorials erected to Abu Khdeir on the spot of his immolation. The international community typically sees the manifestations of Israel’s violent racism only when they erupt as assaults on the Gaza Strip, the West Bank, or Lebanon. But Israel’s increasingly poisonous anti-Arab and anti-Muslim public culture prepares the ground of domestic public opinion long before any military operation and immunizes the army from most criticism of its “excesses.” Moreover, Israeli anti-democratic and racist sentiment is increasingly directed against Palestinian citizens of Israel, who comprise 20% of the population. Given his background, what American Jewish leader Henry Siegman has to say about Israel’s founding in 1948 through the current assault on Gaza may surprise you. From 1978 to 1994, Siegman served as executive director of the American Jewish Congress, long described as one of the nation’s "big three" Jewish organizations along with the American Jewish Committee and the Anti-Defamation League. Born in Germany three years before the Nazis came to power in 1933, Siegman’s family eventually moved to the United States. His father was a leader of the European Zionist movement that pushed for the creation of a Jewish state. In New York, Siegman studied the religion and was ordained as an Orthodox rabbi by Yeshiva Torah Vodaas, later becoming head of the Synagogue Council of America. After his time at the American Jewish Congress, Siegman became a senior fellow at the Council on Foreign Relations. He now serves as president of the U.S./Middle East Project. In the first of our two-part interview, Siegman discusses the assault on Gaza, the myths surrounding Israel’s founding in 1948, and his own background as a German-Jewish refugee who fled Nazi occupation to later become a leading American Jewish voice and now vocal critic of Israel’s policies in the Occupied Territories. "When one thinks that this is what is necessary for Israel to survive, that the Zionist dream is based on the repeated slaughter of innocents on a scale that we’re watching these days on television, that is really a profound, profound crisis — and should be a profound crisis in the thinking of all of us who were committed to the establishment of the state and to its success," Siegman says. Responding to Israel’s U.S.-backed claim that its assault on Gaza is necessary because no country would tolerate the rocket fire from militants in Gaza, Siegman says: "What undermines this principle is that no country and no people would live the way that Gazans have been made to live. … The question of the morality of Israel’s action depends, in the first instance, on the question, couldn’t Israel be doing something [to prevent] this disaster that is playing out now, in terms of the destruction of human life? Couldn’t they have done something that did not require that cost? And the answer is, sure, they could have ended the occupation." The White House appears to be changing its tune on the war in Gaza. During the early stages of the Israeli military campaign, the Obama administration focused squarely on the need for Israel to defend itself against steady rocket fire from Palestinian militants, including Gaza's Hamas rulers. “We need our allies in Israel to do more to live up to high standards that they set for themselves,” Earnest said. And the administration is not alone. The MSNBC host and former Republican congressman Joe Scarborough, who describes himself as a huge Israel supporter, had some pretty harsh words about Israel's military campaign in Gaza. “This continued killing of women and children in a way that appears to be indiscriminate is asinine,” he said. Scarborough added that the offensive in Gaza is bad for both Israel and the United States. What about American Jews, who are understandably among the most consistent US supporters of the State of Israel? How are they feeling about this latest Gaza war? The war has certainly stirred up strong feelings on both sides, which was apparent during rallies — both for and against Israel's military campaign — held in New York. “It's polarizing American Jews along ideological lines, but also very much along generational lines,” says Peter Beinart. He's the author of “The Crisis of Zionism” and a columnist for the Israeli newspaper, Ha'aretz. Beinart says the generational divide in the US Jewish community has emerged over the last several years, but “this war is laying it bare.” In general, Beinart says younger Jews tend to be far more willing to question Israeli government policies — and do so publicly — than their parents' generation. Members of this generation see rising anti-Semitism in Europe as simply the latest example of how the State of Israel is under assault, Beinart says. And it strengthens their conviction to stand behind Israel even if they don't necessarily agree with all of the current government's policies. “That is particularly resonant for people who, in their own lives, may remember things like 1948 [Israel's war of independence] and 1967 [its Six Day War], may have had personal experiences of anti-Semitism in the 20th century,” Beinart says. A recent poll conducted by the Pew Research Center measuring the broader American public's attitude found that twice as many respondents held Hamas (40 percent) responsible for the current violence as they did Israel (19 percent). But the findings for respondents below the age of 30 are striking. Among those between the age of 18 and 29, nearly a third (29 percent) said Israel is most responsible for the current violence compared with 21 percent who blamed Hamas. If you’ve been anywhere near the American Jewish community over the past few weeks, you’ve heard the following morality tale: Israel left the Gaza Strip in 2005, hoping the newly independent country would become the Singapore of the Middle East. Instead, Hamas seized power, ransacked greenhouses, threw its opponents off rooftops and began launching thousands of rockets at Israel. American Jewish leaders use this narrative to justify their skepticism of a Palestinian state in the West Bank. But in crucial ways, it’s wrong. And without understanding why it’s wrong, you can’t understand why this war is wrong too. Let’s take the claims in turn. It’s true that in 2005, Prime Minister Ariel Sharon withdrew Israel’s more than 8,000 settlers from Gaza. (At America’s urging, he also dismantled four small settlements in the West Bank). But at no point did Gaza become its own country. Had Gaza become its own country, it would have gained control over its borders. It never did. As the Israeli human rights group Gisha has detailed, even before the election of Hamas, Israel controlled whether Gazans could enter or exit the Strip (In conjunction with Egypt, which controlled the Rafah checkpoint in Gaza's south). Israel controlled the population registry through which Gazans were issued identification cards. Upon evacuating its settlers and soldiers from Gaza, Israel even created a security perimeter inside the Strip from which Gazans were barred from entry. (Unfortunately for Gazans, this perimeter included some of the Strip’s best farmland). “Pro-Israel” commentators claim Israel had legitimate security reasons for all this. But that concedes the point. A necessary occupation is still an occupation. That’s why it’s silly to analogize Hamas’ rockets—repugnant as they are—to Mexico or Canada attacking the United States. The United States is not occupying Mexico or Canada. Israel — according to the United States government — has been occupying Gaza without interruption since 1967. “Everybody knows, the apartheid regime will stop. The question is how fast, and how many people are going to die… until it will happen? Israel was singled out in 2007 as a top espionage threat against the U.S. government, including its intelligence services, in a newly published National Security Agency (NSA) document obtained by fugitive leaker Edward Snowden, according to a news report Monday. The document also identified Israel, along with North Korea, Cuba and India, as a “leading threat” to the infrastructure of U.S. financial and banking institutions. The threats were listed in the NSA’s 2007 Strategic Mission List, according to the document obtained by journalist/activist Glenn Greenwald, a founding editor of The Intercept, an online magazine that has a close relationship with Snowden, a former NSA and CIA contractor who fled the U.S. with thousands of top-secret documents last year. In this new document, Israel was identified by the NSA as a security threat in several areas, including “the threat of development of weapons of mass destruction” and “delivery methods (particularly ballistic and nuclear-capable cruise missiles).” The NSA also flagged Israel’s “WMD and missile proliferation activities” and “cruise missiles” as threats. In a section of the document headed “Foreign Intelligence, Counterintelligence; Denial & Deception Activities: Countering Foreign Intelligence Threats,” Israel was listed as a leading perpetrator of “espionage/intelligence collection operations and manipulation/influence operations…against U.S. government, military, science & technology and Intelligence Community” organs. The term “manipulation/influence operations” refers to covert attempts by Israel to sway U.S. public opinion in its favor. In this, Israel has dubious company, according to the NSA: Other leading threats were listed as China, Russia, Cuba, Iran, Pakistan, North Korea, France, Venezuela and South Korea. The information includes the content and metadata of phone calls and emails from Palestinian-Americans living in the U.S., in an agreement reached in 2009, according to The Guardian. The agreement calls for the material to be "raw" or unredacted, meaning names and personal information have not been taken out — "which is extremely unusual," Bamford says. "They don't even do that with their closest partners, like the British." It's not clear if information from the NSA was used in the operations the 43 veterans are blowing the whistle on, but Unit 8200 veterans say Israeli spies search intelligence for sexual orientation, infidelity and other indiscretions that could be used against Palestinians living in the Mideast. Unit 8200 is "using that to blackmail, basically, to coerce innocent Palestinians into working for Israel," Bamford says. According to the veterans' letter, "A lot of it was simply being used for political reasons. It was given to politicians for their individual use. They felt that they were involved in political operations as opposed to defense operations." Israeli backlash against the 43 veterans has been sharp. The defense minister has called their actions "criminal," and The Guardian reports Netanyahu accused them of "baseless slander" which "should be condemned." Two hundred other members of Unit 8200 signed a counter-letter defending the agency. "It is not clear, however, what charges the men and women could face," writes The Guardian's Peter Beaumont. "The 43 took legal advice from a prominent lawyer to ensure their letter and testimonies did not break the law, including by revealing their identities." Those who sign the letter only use their ranks, first names or initials. "The text of the letter and most serious allegations were also submitted to the Israeli authorities before publication on Friday," Beaumont writes. Bamford says the NSA is untrustworthy and that Americans should be concerned about its activities. Bamford, who used to work for the NSA, is the author of many books about U.S. intelligence, including The Shadow Factory. "You have a lot of Palestinian-Americans who happen to live in the United States, and if their private communications with relatives in Israel and occupied Palestine, then that puts them at great risk, puts their relatives at great risk," he says. "If they talk about confidential things in an email, or in a telephone call, what right does the U.S. government have to give that information to a government that's basically hostile to them?" Did you hear that the president of Israel said Israel is a “sick society”? Reuven Rivlin, a Likudnik, said this over the weekend. There’s been lots of coverage in Israel, but as Sullivan points out, the declaration hasn’t gotten much attention stateside. I should think it would be viral. The time has come to admit that Israel is a sick society, with an illness that demands treatment, President Reuven Rivlin said at the opening session on Sunday of a conference on From Hatred of the Stranger to Acceptance of the Other. Rivlin wondered aloud whether Jews and Arabs had abandoned the secret of dialogue. With regard to Jews he said: “I’m not asking if they’ve forgotten how to be Jews, but if they’ve forgotten how to be decent human beings. Have they forgotten how to converse?” In Rivlin’s eyes, the academy has a vital task to reduce violence in Israeli society by encouraging dialogue and the study of different cultures and languages with the aim of promoting mutual understanding, so that there can be civilized meetings between the sectors of society. JTA says that Rivlin spoke of abuse he’s received on his Facebook page. Presumably from the right, not the left. This is a country where a settler extremist assassinated a prime minister who was saying he wanted to compromise with Palestinians, 19 years ago. Israel Likud leader Benjamin Netanyahu got 30 seats, the largest of any party in 120 member Knesset. His opposition Labor Party led by Isaac Herzog was second with 24 seats and the Arab alliance was third with 14 seats, the most ever won by Arab parties. The Joint List (the Arab parties alliance) was formed after a new election law raised the minimum threshold for representation in the Knesset from 2 percent to 3.25 percent. The law, sponsored by Mr. Lieberman’s party, was seen by Arabs as a right-wing move to oust their four small parties, Hadash (which includes Jewish members), Balad, Raam, and Taal. The new Arab party, which championed equality for Israel’s 1.4 million Arab citizens, motivated more Arab voters to turn out to the polls than they have in decades. This year 70% of eligible Arab voters cast their ballot, compared to just 56% in the last election of 2013, and 53% in 2009. The Kerry speech today on national television should help open many eyes in the US and abroad. Regrettably, some seem to believe that the U.S. friendship means the U.S. must accept any policy, regardless of our own interests, our own positions, our own words, our own principles – even after urging again and again that the policy must change. Friends need to tell each other the hard truths, and friendships require mutual respect. I have also often visited West Bank communities, where I met Palestinians struggling for basic freedom and dignity amidst the occupation, passed by military checkpoints that can make even the most routine daily trips to work or school an ordeal, and heard from business leaders who could not get the permits that they needed to get their products to the market and families who have struggled to secure permission just to travel for needed medical care. I don’t think most people in Israel, and certainly in the world, have any idea how broad and systematic the process has become. But the facts speak for themselves. The number of settlers in the roughly 130 Israeli settlements east of the 1967 lines has steadily grown. The settler population in the West Bank alone, not including East Jerusalem, has increased by nearly 270,000 since Oslo, including 100,000 just since 2009, when President Obama's term began. There's no point in pretending that these are just in large settlement blocks. Nearly 90,000 settlers are living east of the separation barrier that was created by Israel itself in the middle of what, by any reasonable definition, would be the future Palestinian state. And the population of these distant settlements has grown by 20,000 just since 2009. In fact, just recently the government approved a significant new settlement well east of the barrier, closer to Jordan than to Israel. What does that say to Palestinians in particular – but also to the United States and the world – about Israel’s intentions? On November 29, 1947, the UN General Assembly voted to establish a Jewish state (alongside an Arab state) in the Land of Israel. Sixty-nine years later, on December 23, 2016, the UN Security Council voted to try to save it. Resolution 2334 that was approved Friday is a gust of good news, a breath of hope in the sea of darkness and despair of recent years. Just when it seemed that everything was going downhill – the deepening occupation increasingly supported by America, with Europe galloping to the right – along came a Hanukkah resolution that lights a thin candle. When it seemed that the evil ones would remain victorious, along came New Zealand and three other countries and gave the world a Christmas gift. So thanks to New Zealand, Venezuela and Malaysia. True, the Christmas tree they’ve supplied, with all its sparkling lights, will soon be removed; Donald Trump is already waiting at the gate. But the imprint will remain. Until then, this temporary rejoicing is a joy, despite the expected hangover. We of course must ask U.S. President Barack Obama in fury: Now you’re doing something? And we must ask the world in frustration: What about actions? But it’s impossible to ignore the Security Council decision that rules that all the settlements are illegal by nature.